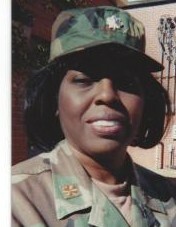 Retired US Army Lieutenant Colonel Clara Jean Sawyer was preceded in death by her loving father and mother: Stoten and Estella Sawyer; Brothers: Johnny and Charles Sawyer; Sisters: Odessa Williams, Bernice Martin, Helen Walker, and Mary Green; She leaves to cherish her memories Two Sisters: Annie Kirkland of Cleveland, OH., and Rosia Dowdell of Alabaster, AL. ; Sister in law: Gwendolyn Sawyer of Calera, AL. ; Two Brothers in law: Bobby Dowdell and John Williams both of Alabaster, AL. ; and a host of nieces, nephews, cousins, and other relatives and friends.